The new collections feature in Interfolio’s Dossier enables you to build any number of standing lists of your materials for different purposes or aspects of your academic life. It’s an early step towards a new Dossier that will better support academic candidates’ ongoing needs throughout their careers. On your “Materials” page, alongside the “Active” and “Archived” tabs, we’ve added a tab for “Collections.” You can create any number of collections, and you can mark any file stored in your Dossier to be included in any number of them at once. See the detailed instructions here. Collections should help you get some of the legwork out of the way in advance around compiling and double-checking your academic materials, giving you a way to clearly mark files you’re going to want to include in certain types of applications or packets. Currently, the collections feature is a simple “staging ground” where you can arrange a bunch of materials stored in your account under a particular header. With future releases over the coming months, collections are going to start to connect more functionally with other parts of your account. Your candidate packet, if you are a faculty member up for tenure, promotion, or review. Different types of academic applications, if you are seeking, say, academic jobs, fellowships, or grants. 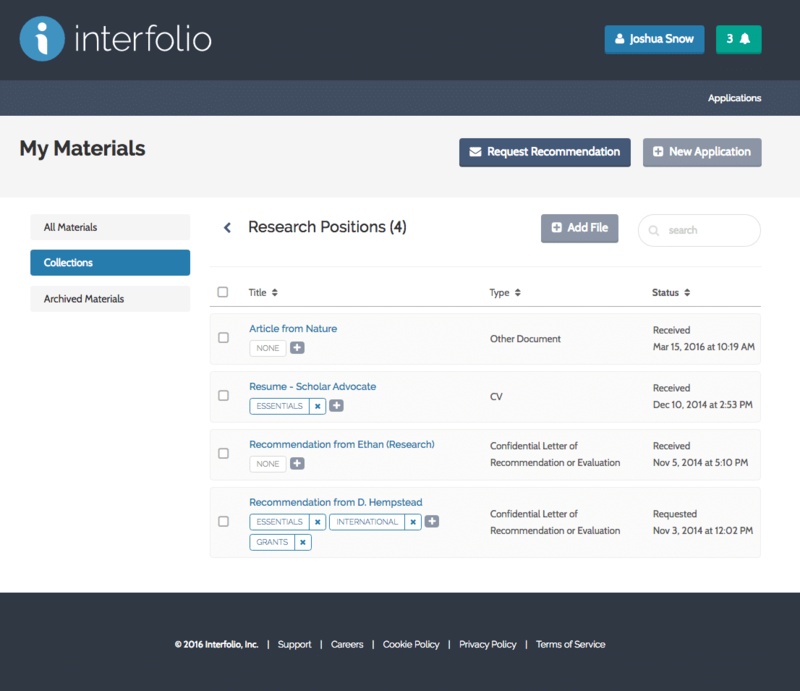 Even for submissions of academic materials that take place outside of Interfolio, collections in your Dossier account are a simple way to gain ready access to a particular grouping of your files. Most immediately, we realized academic candidates were often doing redundant work around assembly and “version control” (Is this the statement that mentions my activist work, or no? Is this the letter Jan wrote me for teaching positions, or for the fellowship?) every time they had to submit their materials somewhere. But here’s the bigger thing we’re trying to account for: you don’t only need to present your academic accomplishments and character today—you’re going to do it many times throughout your career, under different circumstances. Your long-term need to manage your materials doesn’t go away as soon as you complete an individual application, or even when you submit your tenure packet. Today’s release is the first step in a broader vision of Dossier—growing beyond the individual submission of materials at a single time, and becoming more of a standing “hub” of all the materials and information that you might muster at different points during your academic life. Sign into your account now to see what we’re talking about and create your first collection!